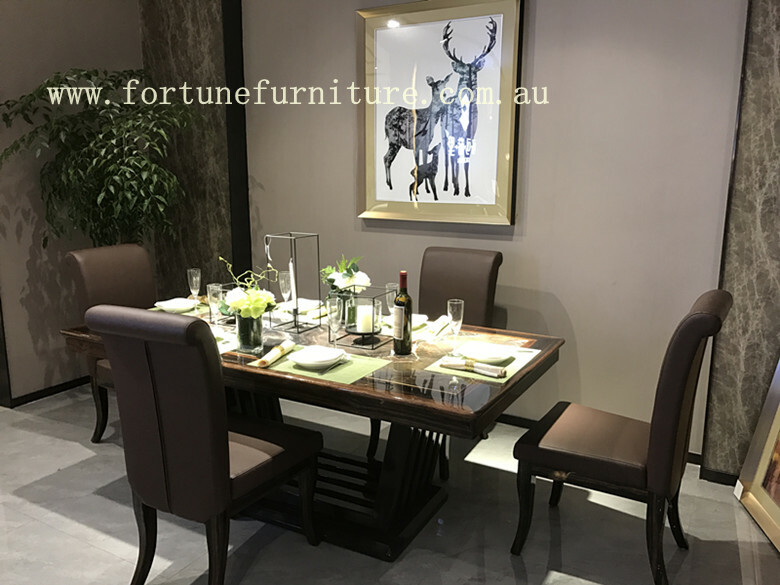 Add a striking element to your dining room with this Dale Rectangular natural onyx dining table.The dale,Natural Marble(onyx) dining table is a master piece for anyone who looks for to make a stunning furniture piece in the dining room .Plus Natural Onyx shows unusual and luxurious. Legs: choose from : solid timber legs and stainless steel legs . Legs:using brush gold finish stainless steel . 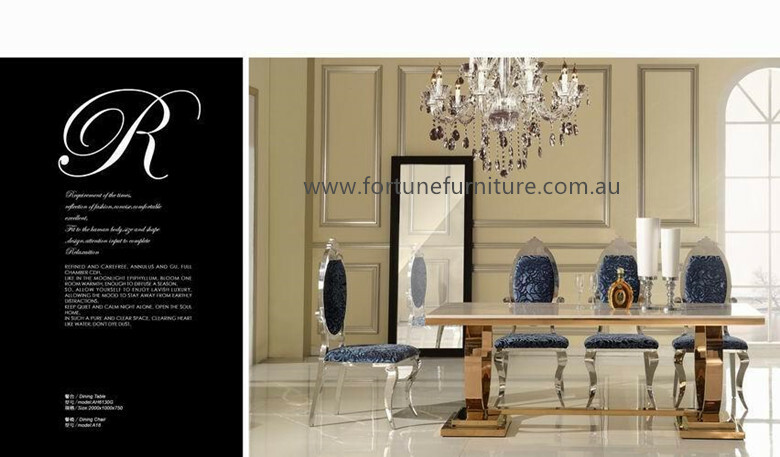 Size: custom made size from 1.6 m -2.4 m .
Price: 160*90*75 cm @ $899. size 2.2 to 2.4 m can be ordered . 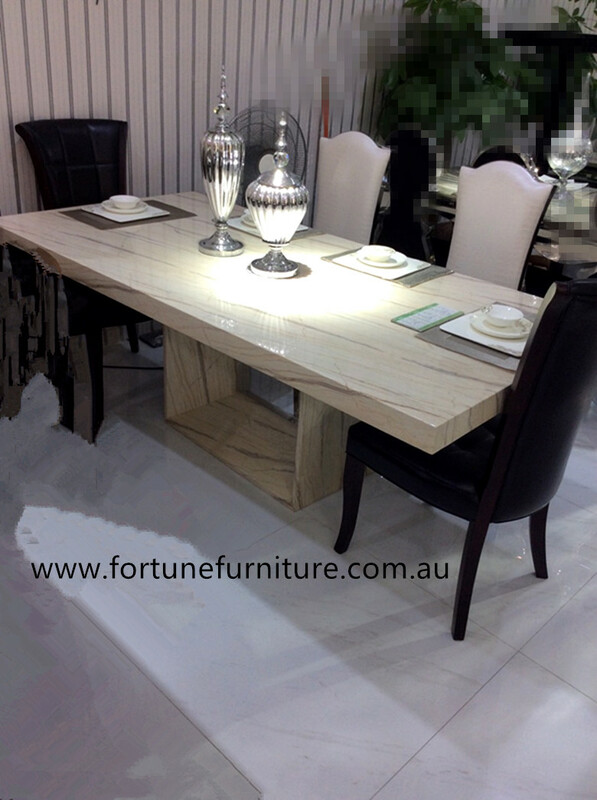 Delano classical Dining Table features antique white finish with hand carved style layers. This stunning Delano classical Dining Chairs features antique white finish with hand carved style overlays and upholstery with fabric. 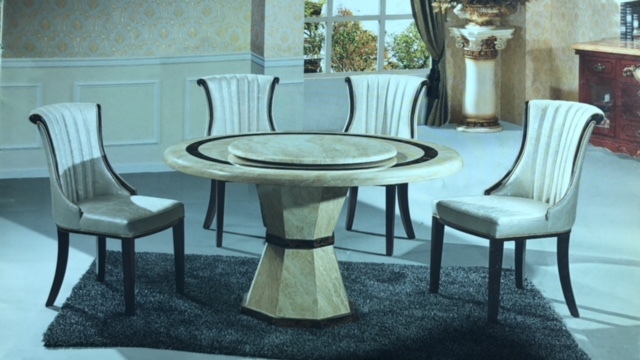 Compact in size and stylish,Melisa artificial marble Round Dining Table is perfect for apartment living or casual dining. 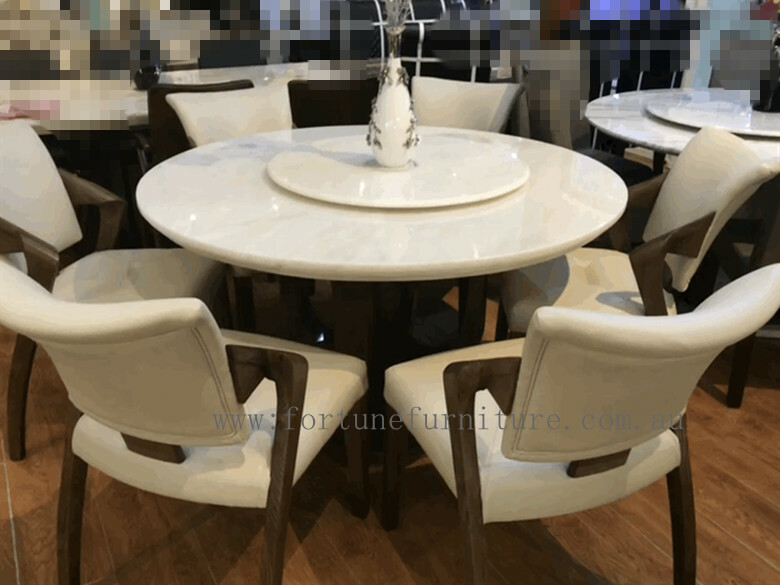 The rounded top with single marble base allows you to comfortably seat four – six people for an intimate dinner party while still having space to feast.The Lazy Susanne on the top of the Table make it more attractive. 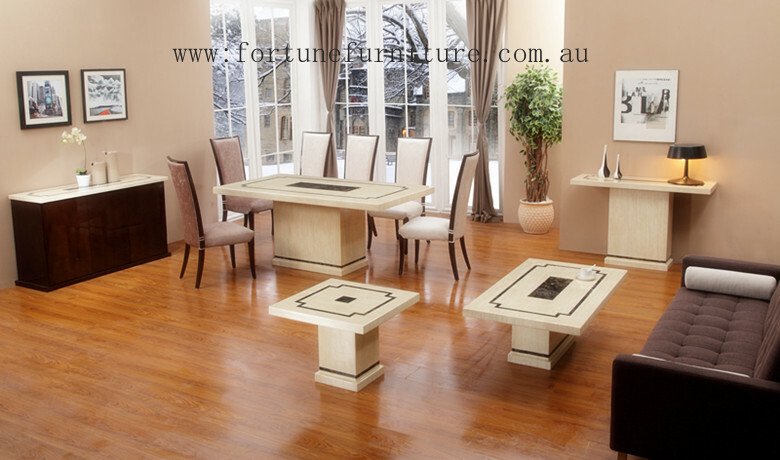 -Table can be order from size 1.2m to 1.6m. 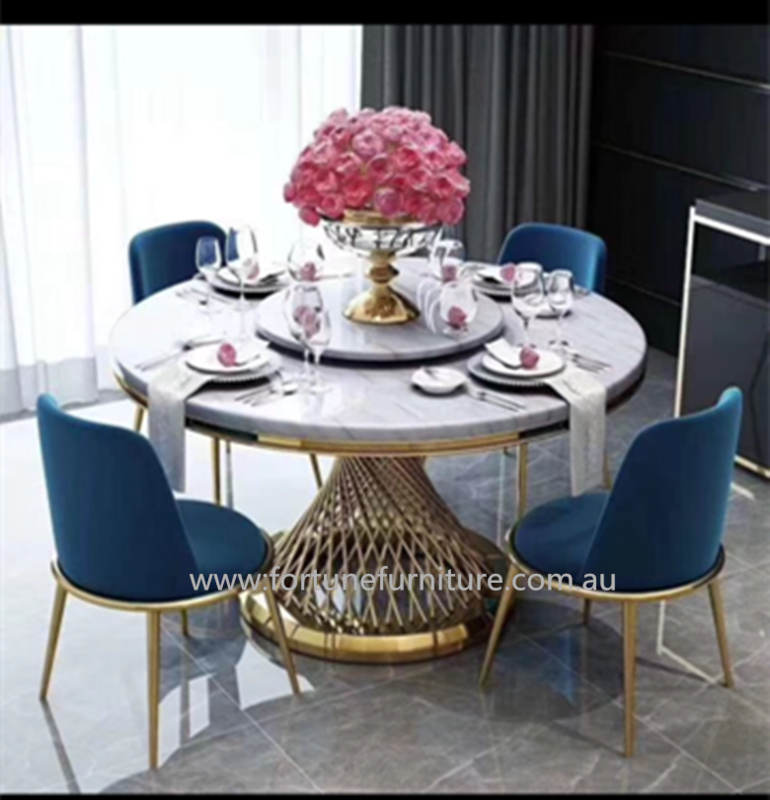 A beautiful dining table with a atificial marble table-top sitting on a rose goldl frame.This table’s sleek surface and stylish base create and eye-catching combination. The perfect small round wallnut veneer plus top tempered glass. 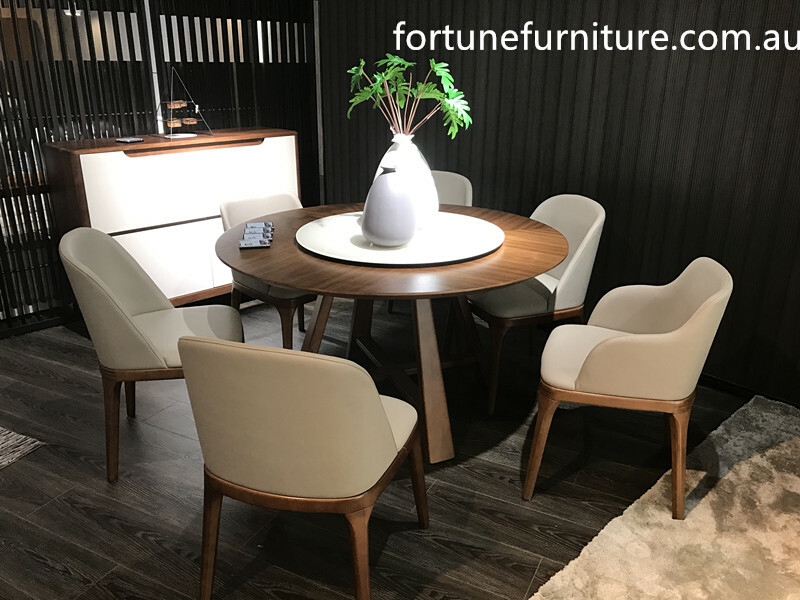 Featuring four legs tapered legs designed from the center of the table, 4 people can seats comfortable and the compact size is ideal for smaller units and open plan living. 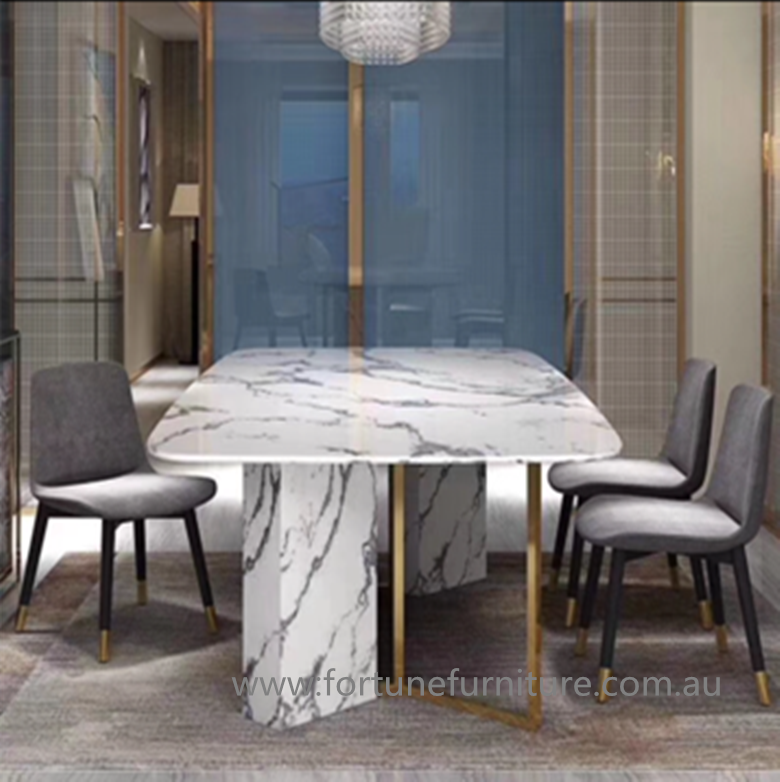 Description: Dahna Dining table (2928) is thoughtfully & elegantly designed and skillfully handcrafted by our stone masons and carpenters.The luxury natural Italian marble will bring a touch of class and elegance to any space. 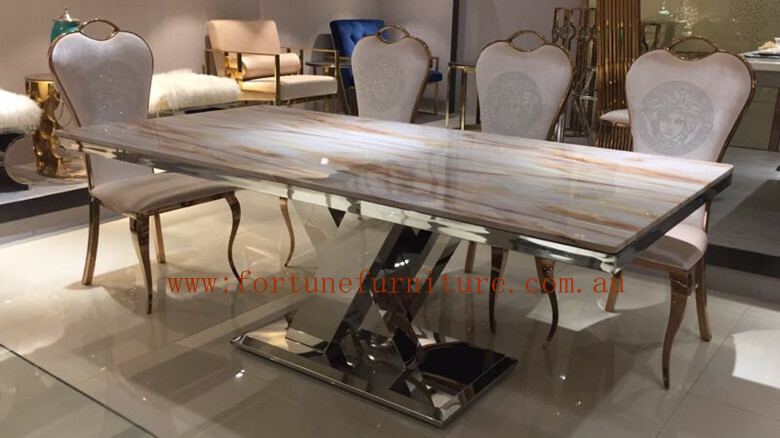 A beautiful modern dining table with a marble table-top sitting on a artificial marble legs on the middle. 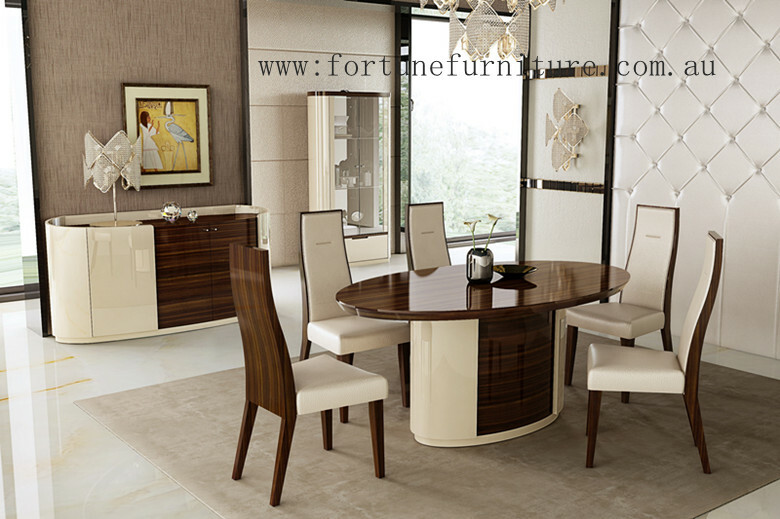 The Glory Dining Table and Coffee Table has a gorgeous geometric shape that is both modern and timeless. The intricate base creates the illusion of more space in the home, so is a great way to open up a room while adding a stylish feature. 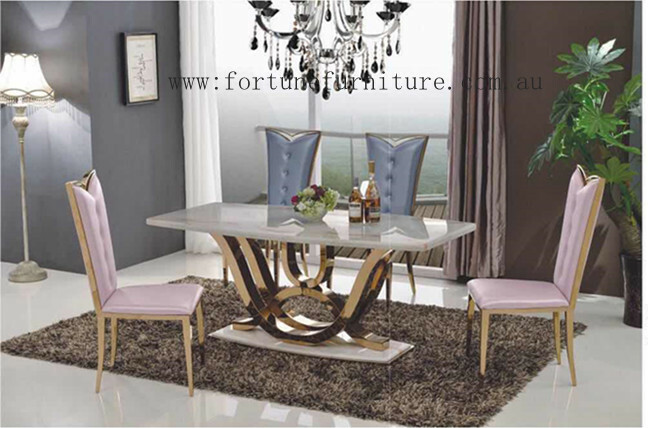 You can choose different marble color and change the base into stainless steel or rose gold. 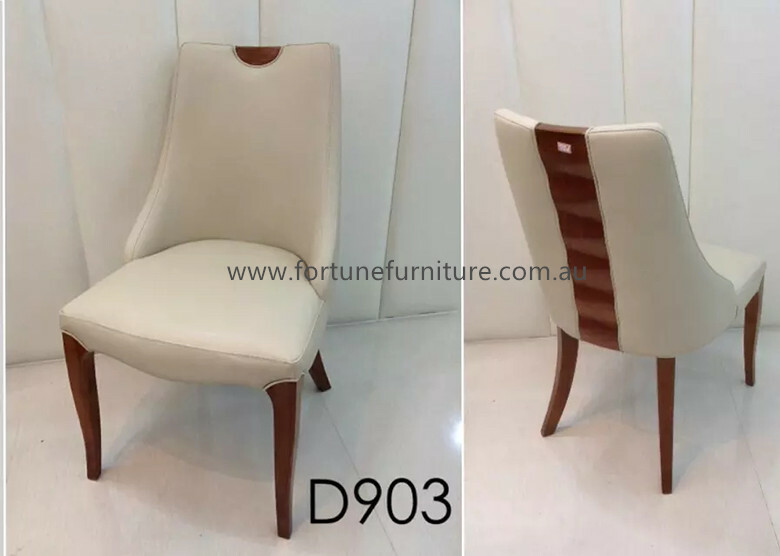 Made from high quality of durable bonded leather and with sturdy frame. 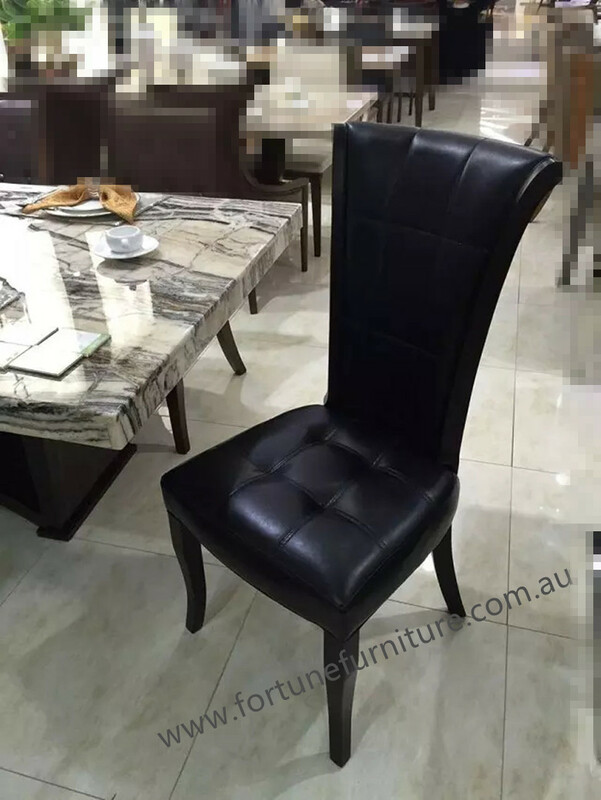 These Delight C52 dining chairs are an elegant living room feature. 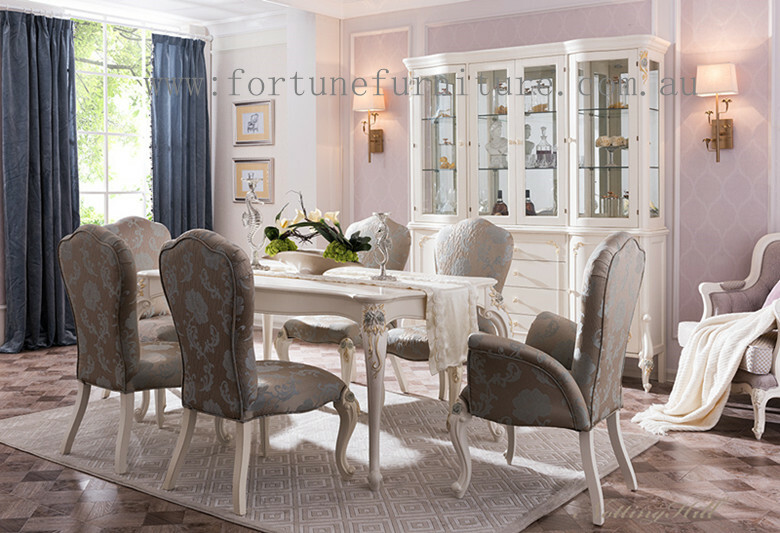 Delicate & stylish, these French provincial dining chairs are ideal for any dining room. 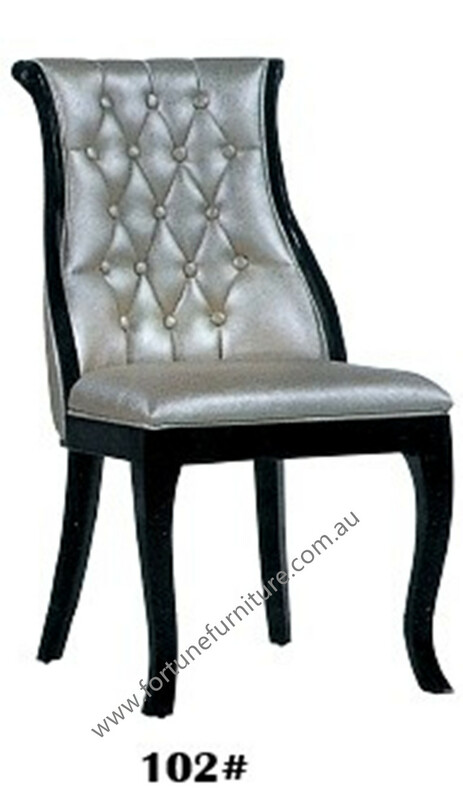 Featuring Special PU upholstery & timber legs. 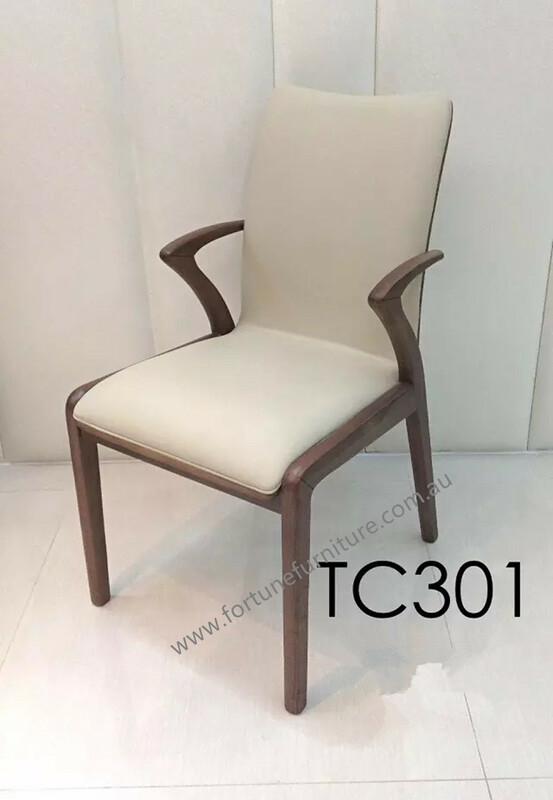 Cindy 301 is a upholstered in Bonded leather with sturdy frame this chair is a perfect addition to any Dining table . stocks availability: in April 2017 . 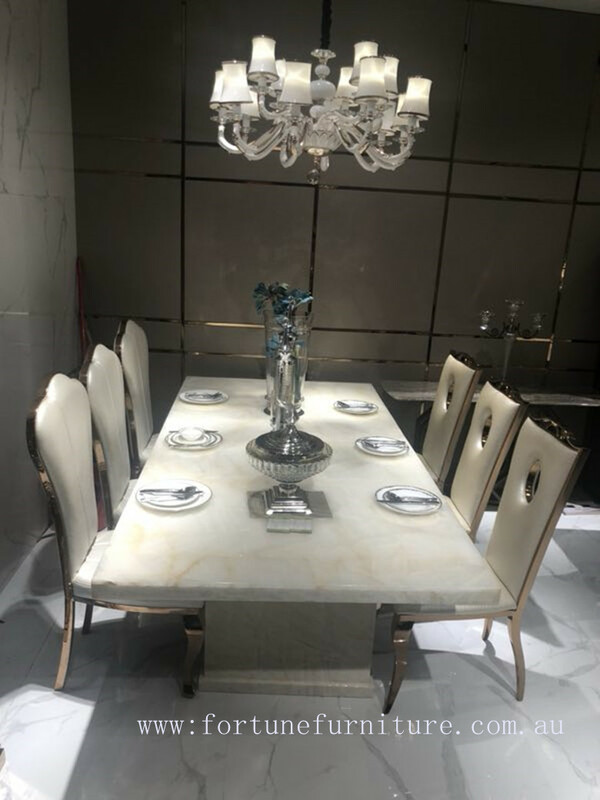 A beautiful dining table with a marble table-top sitting on a Stainless steel frame.This table's sleek surface and stylish base create and eye-catching combination.